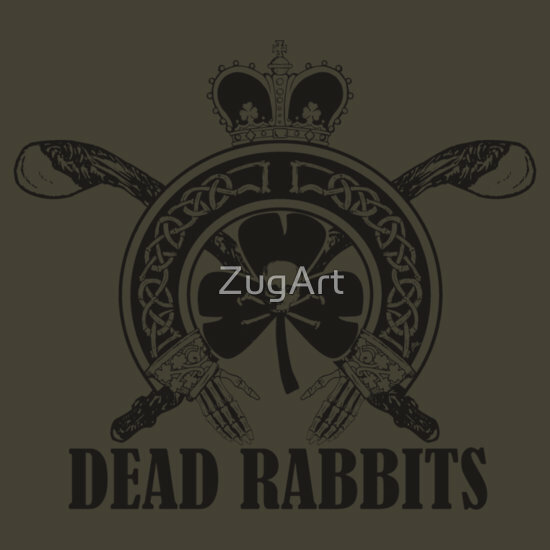 There is a clover (only three leaves) in the logo, but are the Dead Rabbits from Ireland? I like the crown, the skull & crossbones, the skeleton hands, the intertwined branches, and the femurs (or are those golf clubs?). Actually, if those are golf clubs, this is probably a Scottish band, and this has nothing to do with Ireland or St. Paddy’s Day. Whatevs. WAIT A MINUTE –> I’m pretty sure this shirt is in reference to the Irish gang in New York, which you might have seen in Scorsese’s movie, Gangs of New York/. In other new, it looks like the band is from Phoenix, AZ, and they’re kind of awful if this song is any indication. He likes his cocaine yellow. Thanks for sharing Zar…gotta check that out.